Frames Per Second (fps): The basic unit of time animators and film-makers deal with is determined by the recording and projection rate of the individual film frame or video image. Animation Timing: Unlike live-action filmmakers, which depends on actual recorded time, animators can construct time and determine the speed of action by using animation timing techniques, like Pacing, Phrasing and Timing of an action. Pacing: Pacing is concerned with series of sequences and how they relate to each other in order to create a coherent whole. The pacing of an animation or film should vary from scene to scene. This allows the animator to create a sense of narrative within the sequences and play with viewer's emotional connection to the story. One scene may move slowly if the mood is sad, another may move quickly if there is physical action. Phrasing: Phrases refers to the actions of a specific character or environment that within a sequence or scene. As a character goes through changes in action or mood, his/her/its dynamic action may speed up or slow down depending on the narrative calls for. Timing (of an action): Timing is the period of time it takes for a specific action to take place. It is determined by the sequence of images and their relative position to the preceding and following images. The closer the images are to each other on screen, the slower the action, the greater the distance between images, the faster the speed of action. Animation timing can vary depending on the style and type of delivery. One animation can have more than one style of timing too. Spacing (how close or far apart the object is spaced between the beats). Keys: The main points within the animated action that represent a defining position or change within the movement. The keys tell the story. Breakdowns: The first inbetween drawings that are created between two keys. Breakdowns help describe the action. 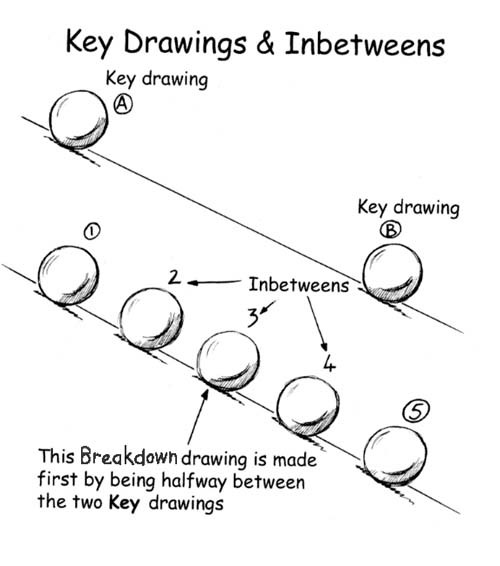 Inbetweens: Drawings created to appear in-between the key and extreme drawings. The placement and number of these drawings give the animation its timing. Slow out: describes and action that progressively accelerates out of a key frame. Slow outs are used at the beginning of an action as the initial inertia is overcome. A heavy object with greater inertia to overcome will have a longer slow in than a lighter object with less inertia. Slow in: describes an action that decelerates towards a keyframe. Slowins are used as an object is coming to rest at the end of action. Objects that have more mass and momentum will have a longer slow in than those with less mass and momentum. A pendulum is a good example to show slowout and slowin. Flash animation using TRADITIONAL ANIMATION techniques. Use this template to begin. On the first layer, animate a ball moving back and forth across the screen, using even timing. Do this in 24 frames. On the second layer, copy and paste your frames from layer one and modify the spacing of the keyframes, using slow out techniques to vary the timing of the movement. On the third layer, copy and paste your frames from layer one and modify the spacing of the keyframes, using slow in techniques to vary the timing of the movement. In a new Flash file set up keyframes for a pendulum animation. Draw the keyframes on frames 1, 24, 48 and the breakdowns on frames 12, 36. Add inbetween frames to complete the animation using slow out and slow in. Set the axis point to the top and center of the string. Use the transform tool to rotate the pendulum. Finish Flipbook if you haven't yet. Slow in Slow out Experiment, and Pendulum Exercise. Read pages 14-35 in Text Book. Bring an external drive or DVD-R to backup your work. Bring in your drawing tablet.